From I-20, Exit #108 to Cheniere/Drew Left onto 546. 2.6 miles then Right onto Arkansas Rd. Faith UMC is 1.2 miles on the Left. 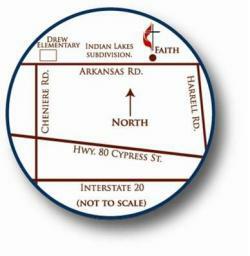 turn Left onto Cypress St. (Hwy 80). At end of Harrell Road, turn Left onto Arkansas Rd.